The Pileated Woodpecker has a name to stumble over—is it pie-lee-ated or pill-ee-ated? A trip to the online Merriam-Webster Dictionary shows that both pronunciations are correct. So nobody has anything to grumble about, right? But I still prefer pie-lee-ated—the language of my youth! This non-migratory woodpecker is big, about 17 inches long—just 2 inches shorter than the American Crow. Even with its large size it is rather adept at avoiding detection. The Pileated is a striking bird, with its bold black and white body and its bright red crest—if you are lucky enough to see it. It is frequently seen flying strongly overhead, in somewhat bounding flight. The species’ range in Oklahoma, generally speaking, is the eastern half of the state, so seeing a Pileated in central Oklahoma always makes for a good day. They have been seen in northeastern Oklahoma City (not far from Frontier City); near Lakes Draper and Thunderbird; in the Bridgestone Preserve (near the Canadian River, downstream from Overholser Dam a mile or two); and in northern Oklahoma County and southern Logan County. No doubt they can be found in the Lake Arcadia area as well—who has a record here? I have been surprised to never find them in Stinchcomb Wildlife Refuge, in the heavy timber north of Lake Overholser. Has anyone ever seen them here? Over all, I think Pileated numbers are gradually rising in central Oklahoma and are slowly advancing westward. This westward encroachment is probably due primarily to fire suppression that has allowed tall timber to advance westward, particularly along riverways. There are now records westward to the Wichita Mountains, Great Salt Plains National Refuge and Boiling Springs State Park. 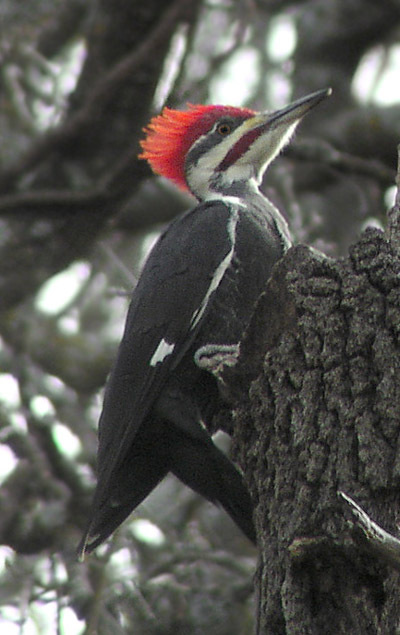 A humerous story about Pileated Woodpeckers occurred east of Norman, out toward Lake Thunderbird. Warren Harden was taking a bunch of us on a field trip—and I do mean field—big field. We were looking for, and found, the target species, Smith’s Longspurs. As always Warren was showing everybody both the longspurs and a good time, when someone noticed two large birds flying over the middle of the field. We checked them out and they were Pileated Woodpeckers! It was strange—and a little more than interesting—to see these woodpeckers so far out of their usual habitat, stands of tall timber. Some time later (weeks, months?) one couple who had been on Warren’s field trip asked him, apparently seriously, when he was going to lead another trip to that field so they could see the woodpeckers again! Much of the information below is based on A.C. Bent’s “Life Histories of North American Woodpeckers” (1939). There was a time when survival of the Pileated was of concern. This was about 1880-1920, according to Bent. Eastern forests had generally been logged heavily, and the Pileated was still being hunted for food. 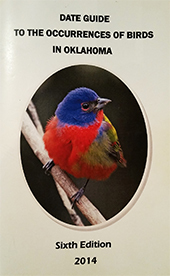 According to one report, the bird had a sweet and sour flavor to it, not good tasting at all. It was speculated that the sour taste of the meat came from formic acid in ants, the woodpeckers’ primary food item. After 1920, as that generation of Pileated hunters died off and as cutover forests began to regrow, the Pileated made a comeback. Its nest cavity is usually dug in a dead tree that is barkless at the nest entrance, averaging about 45 feet high according to Bent, but probably a few feet lower, on average, in Oklahoma. The nest entrance tends to be oval but a bit triangular (somewhat pointed at the top). Size of the entrance hole averages about 4 inches high by 3.25 inches wide. Although it is now autumn, and the above information is spring-related, the Pileated does dig out similar cavities for roosting in the non-breeding season as well. Being non-migratory, both nesting and roosting cavities are found in the same general area, and a suspiciously large cavity as described above might be your first clue that a Pileated is around. 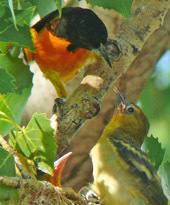 So watch for these impressive birds, and their cavities, here in central Oklahoma.